5000 passengers were supposed to slumber for 120 years, but 2 awakened early! 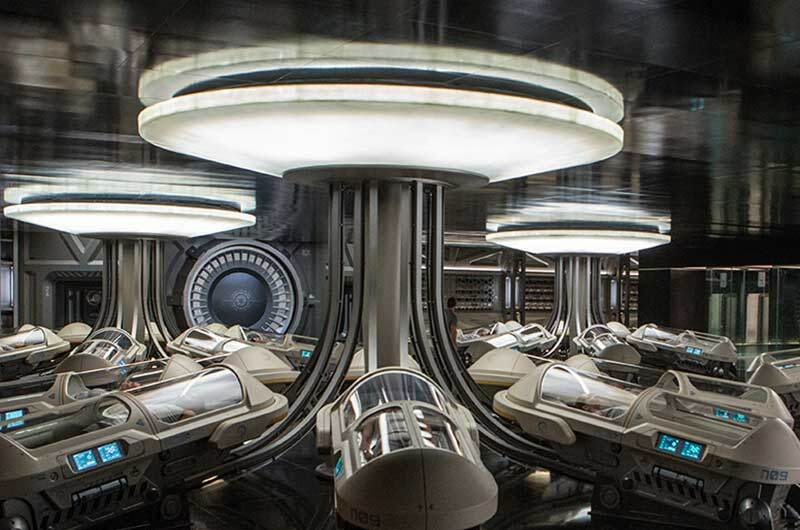 For the enormous 120’ by 190’ set, Production Designer Guy Hendrix Dyas designed an arrangement of sleepers around pod ‘trees’, 8-10 individuals on a single umbilical cord that would service those bodies collectively x a factor of 500! “Guy uses the term 'jewel box’,” Serdena says. 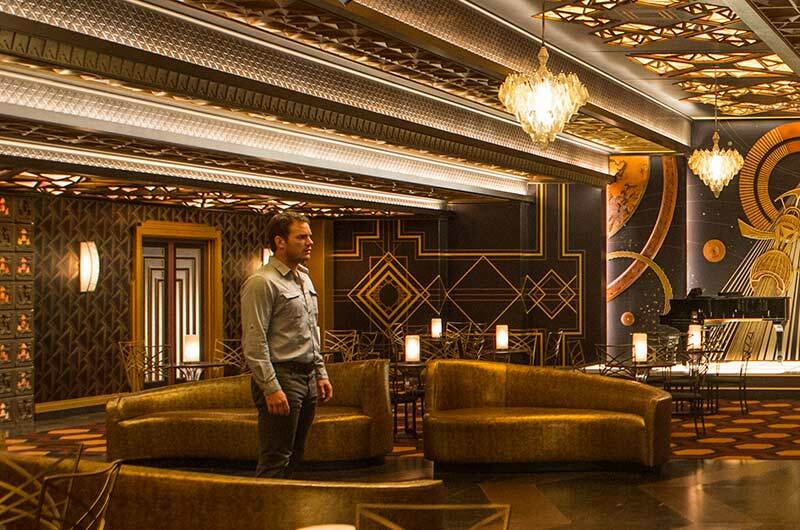 To make this vision a reality, Tyldum turned to Production Designer Guy Hendrix Dyas and Set Decorator Gene Serdena SDSA, each an Oscar® nominee for the films INCEPTION and HER, respectively, and the amazingly talented teams they assembled. Since childhood, Dyas had dreamed of building a spaceship inside and out, and PASSENGERS made that dream a reality. Serdena has always been on the cutting edge of design and decor. The result was a series of enormous, hugely memorable sets that brought the Avalon to life. 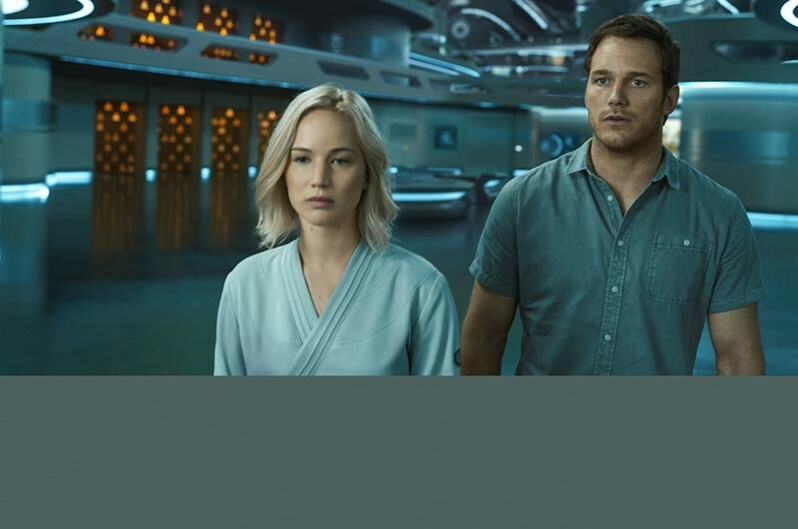 Looking to the future, they created a spaceship with an intricate design that uses the centrifugal force from spinning blades to create gravity, and contains the robots, holograms and other technology that the future has in store, as well as incorporating a “nostalgic design” inspired by Art Deco and classic Hollywood. “The past is with us, the past inspires us...and I wanted to have the past to be very present in this film about the future,” says Tyldum. Set Decorator Gene Serdena SDSA: Working together on the previous film helped us develop a rapport that allowed a certain amount of shorthand in our approach to the new material. It’s usually the case with new colleagues that you have a phase of discovering and adapting processes to achieve maximum compatibility. 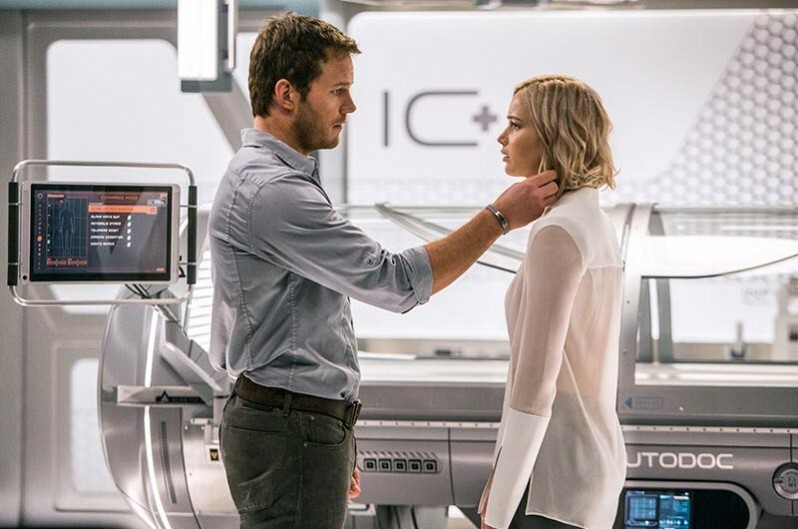 I like to think of it as a “courtship” phase of filmmaking, and it’s fraught with potential landmines — mostly brought about by the pressures of accelerated schedules and finances. Fortunately, Guy and I fell quickly into a synchronicity that allowed us to indulge in a luxurious, creative space. He’s a man of astonishing energy and can be a brutal taskmaster in the pursuit of achieving his vision. I think one of the aspects of character that we both share is we are “idea” people. We both are constantly pitching new ideas to one another, and revel in the kind of excitement that good ideas generate. Guy is innovative in his willingness to pursue a design scheme that might be unorthodox, an idea that threatens to collapse on itself due to its sheer audacity. When pitching the prospect of us working together on PASSENGERS Guy mentioned that he took pleasure in my “eccentricity” and was curious to see what my particular sensibility might bring to “a spaceship movie.” I get from Guy an unwavering support for my creativity, a willingness to consider my opposition to some ideas, and a deep appreciation for the unexpected moments my team and I create that give dimension and scope to the settings. 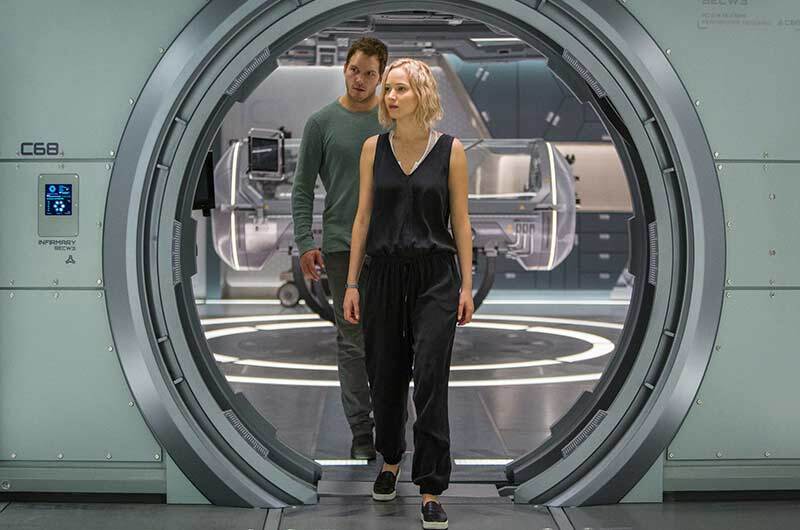 SET DECOR: And the two of you collaborating with Director Morten Tyldum? 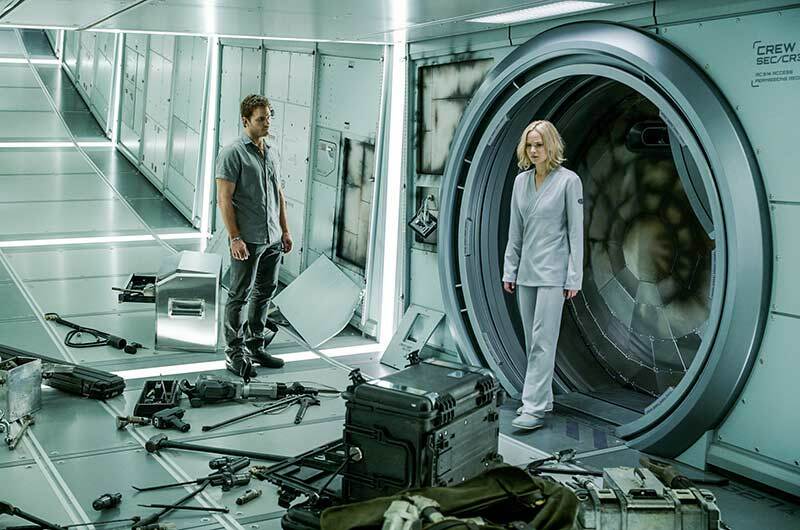 Serdena: This was our first time working with Morten, whose approach to the storytelling was both epic—in terms of the grandeur of the spaceship and its seemingly endless vistas—and intimate—in terms of the sense of closeness and vivid interiors of the two main characters, Aurora and Jim. Morten was very conscious of the fact we were creating a world that embodied technologies that hadn’t yet been invented, and how that philosophy might manifest in the film’s design. 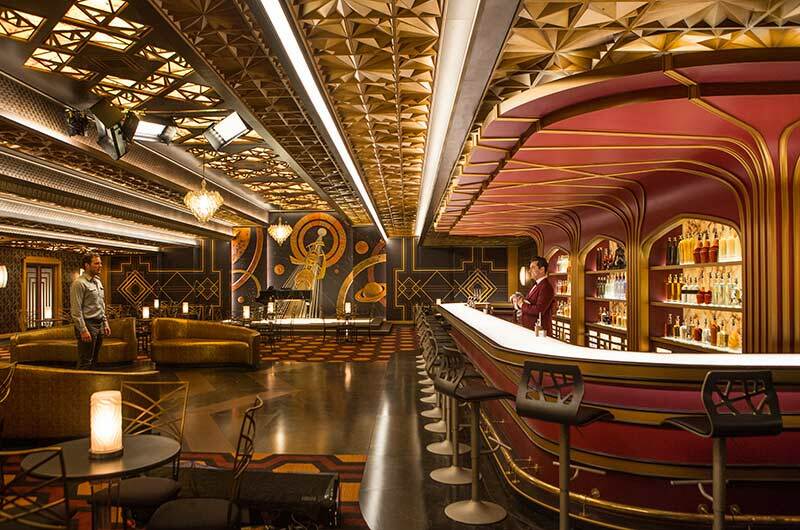 While we created spaces that paid homage to certain periods and styles—an eclectic mashup between Frank Lloyd Wright-inspired sculpted tiles and Art Deco flourishes in the spaceship’s Grand Concourse Bar—you’ll notice there are few technologies on display that would ground us in a recognizable historical setting. Lighting, for example, became a gloriously frustrating task to achieve. We had to design or modify light fixtures to avoid revealing an obvious light source. Our cultural progress through incandescence to compact fluorescence to LED lighting has been so rapid of late, that it became apparent that we didn’t want to risk failing the audiences’ expectations, nor imaginations, of what a future technology might be. Morten is a very philosophical individual and would devote himself to lengthy considerations of what it meant to choose a particular style of chair and send it into space. Obviously, we were limited by things that exist in the world, and there are certain conventions that require fidelity—chairs have existed for centuries in recognizable forms, as such, and so how do you select a chair when you’re decorating for the future? The governing principle became one of familiarity. The notion was that if something was recognizable as ubiquitous in our culture, then it was dismissed. You can imagine the complications that might arise given such a rigorous design program. 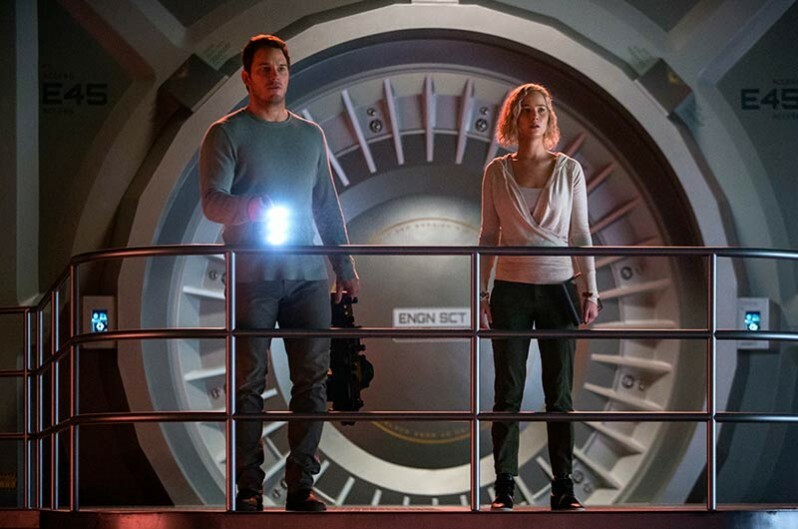 SET DECOR: Do tell us about the making of an outer space film...in Atlanta! Serdena: In preparation for working in Atlanta, I spoke with several colleagues who’d spent significant time there, and was advised about the kinds of things that were more readily available, and the kinds of goods and services I could expect to outsource. Atlanta is a newer city to filmmaking, compared to Los Angeles and New York, and the rich traditions brought about by studio culture haven’t yet been embedded in its DNA. I was very fortunate to have a mixture of talented craftspeople from various locals: Los Angeles, Chicago, San Francisco, Detroit, and combined with the talents of some very fine Atlantans, I was able to put together what can only be described as an all-star team. The poverty of language doesn’t permit me to describe the depth of respect, admiration, and affection I have for film craftspersons, particularly of the Set Dressing variety. The people on whom I routinely rely—Leadman, Buyers, Drapers, Set Dressers, Fabricators, Set Dec Painters—are all workers with the skill of great artists. They surprise me with their solutions to design and rigging problems, and move me with their lovely temperaments and abilities to accommodate changes on-the-ground. I would describe myself as an exacting and demanding individual, so the team I carry has the bar set very high. My experience in Atlanta on PASSENGERS left me awestruck at the capacity of people to do excellent work week-after-week, set-after-set, under duress and, often, without sufficient rest. I had the security of bringing some top experienced professionals and I was fortunate to marvel at the blossoming of newer craftspeople — to bear witness to the development of their craft, and to see them swell with pride at their achievements. 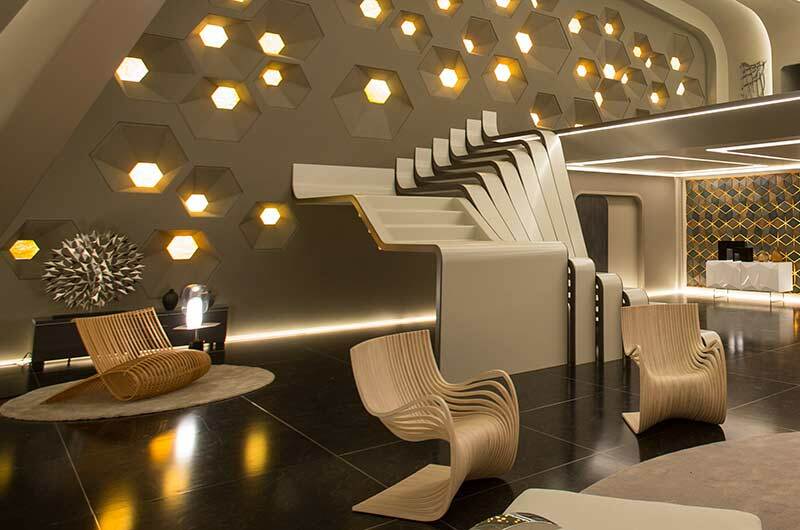 SET DECOR: Please tell us about dealing with the future, both in this film and HER, for which you and Production Designer K.K. Barrett deservedly received an Oscar nomination. Serdena: The job of designing for the future took different avenues for PASSENGERS in comparison to HER. I think the different approaches were governed in part by story, in part by budget, and, obviously, by virtue of working with different Production Designers. 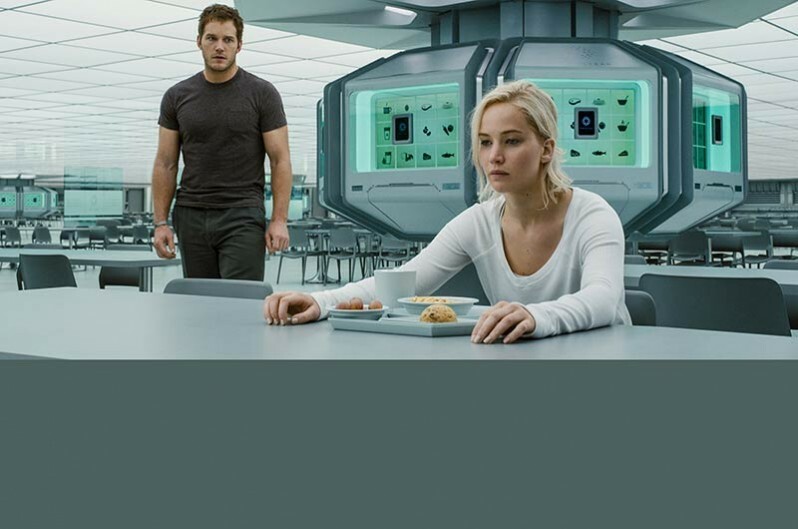 HER was an inversion of the futuristic sci-fi movie. Rather than imagining a bleak, dystopian environment, Director Spike Jonze envisioned a utopian setting that exacerbated the protagonist's inability to find connection. The very beauty of his surroundings heightened his loneliness. 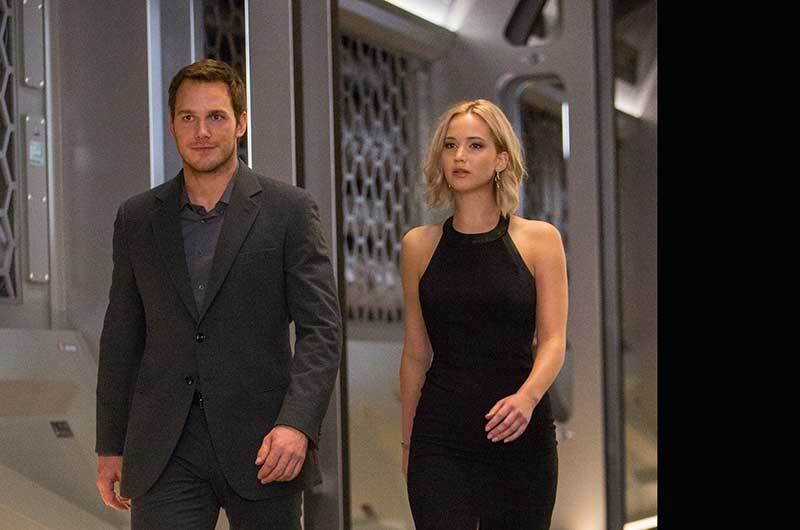 The model for PASSENGERS differs in that the characters journey across massive and luxurious settings but they're still imprisoned by their isolation, and the expansive nature of the sets serves as a reminder of the absence of people. 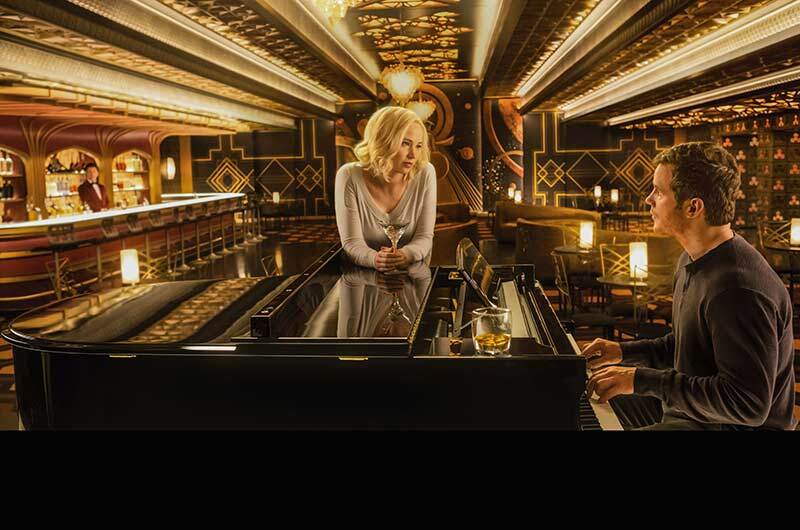 We see restaurants, and bars, and public spaces that are designed to accommodate a cast of thousands, and yet it's, mostly, just Jim and Aurora. 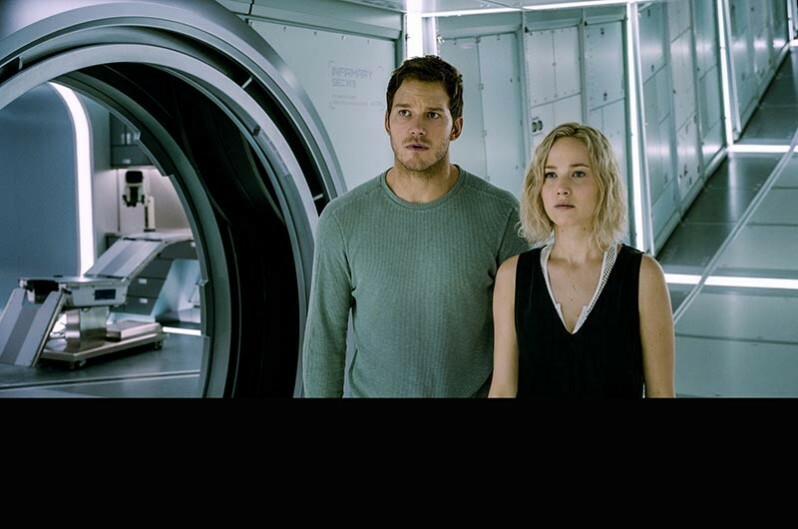 The spacecraft, which is definitely an important character in the story, serves as a canvas against which the characters can project romance or comedy, or tragedy, in copious doses, as the story dictates. In HER, we created a world in which the characters fetishized certain materials to which they might harbor a romantic affiliation or nostalgia. For PASSENGERS, we tried to create a world in which everything was of such high design that its technology was virtually masked by smooth, impenetrable surfaces. 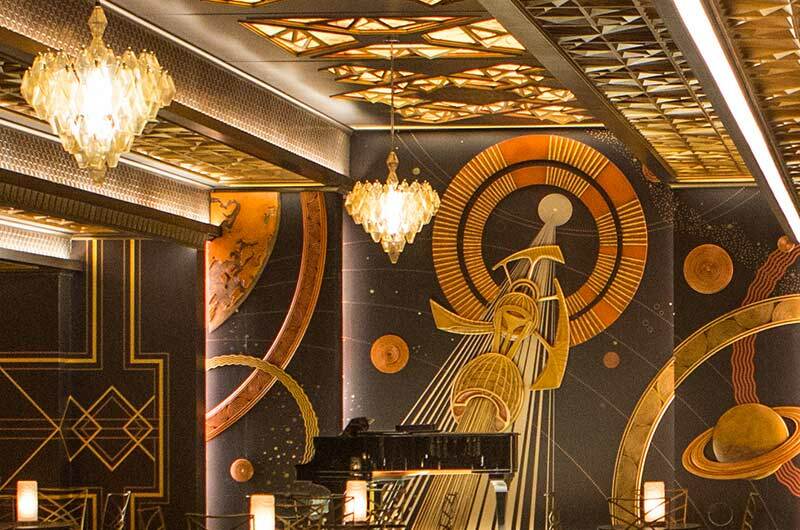 Who would think to put Art Deco in space??? Guy Dyas and you! 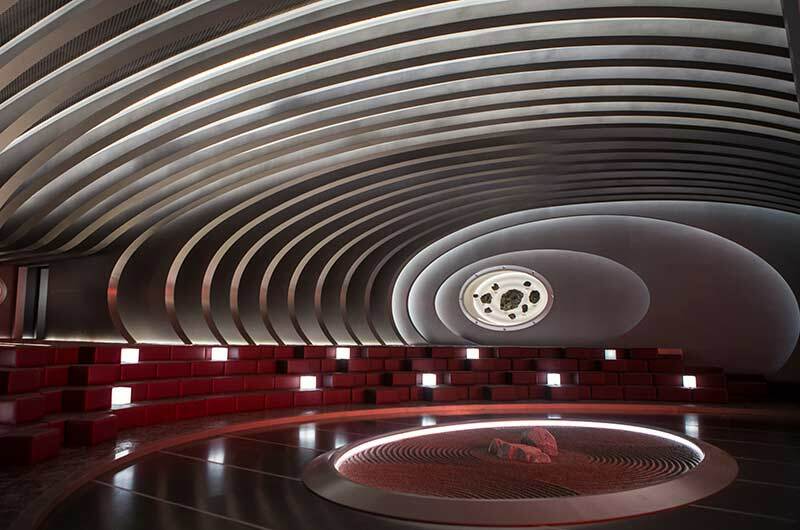 Serdena: Guy uses the term “jewel box.” It perfectly describes this place that becomes a warm, intimate and romantic respite from the austerity and vastness of the spaceship. 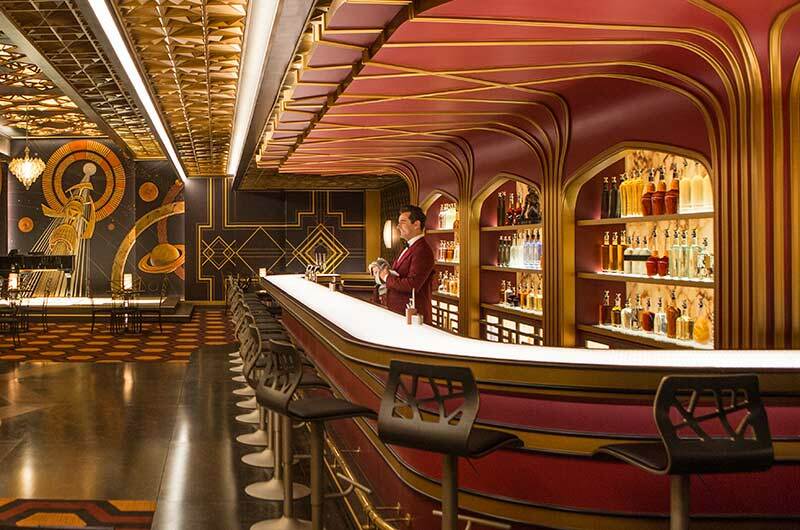 There is constant companionship available in the form of automated bartender Arthur [Michael Sheen]. The marriage of historical styles—art deco, prairie school, disco—and occasional nods to classic cinema (See if you can guess) becomes, I think, a harmonious one in the Bar. Mr. Dyas's audacity is on full display here. The balance of pattern, color and light becomes a high wire act that threatens to collapse onto itself, but in Guy's deft hands, becomes a sublime, romantic experience. Serdena: The Forward Observation Deck and Observatory had to fulfill a number of story functions, so I started to jokingly refer to it as "the living room." 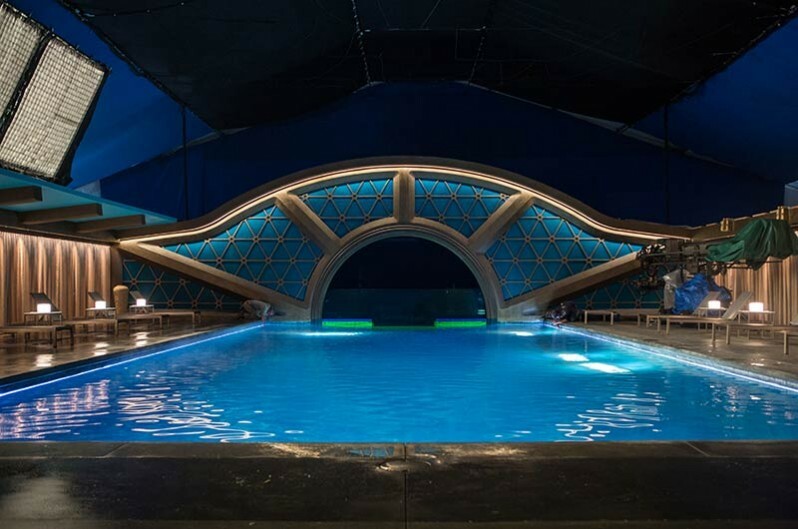 Its nautilus shape, which is actually a practical set rather than CG environment, is hypnotic in its beauty. The challenges of fabricating a series of upholstered blocks that are built on a concentric radius and have to function as practical seating in the amphitheater setting surpass description. We were all extremely happy with the success of this technical achievement, the measure of which becomes the "oohs and ahs" you receive as the incoming crew marvels at their surroundings. Serdena: The Cafeteria, for all its simplicity, was extremely challenging from a technical perspective. The food dispensary required a level of fabrication that demanded the collaboration of many departments to achieve functionality. The selection of chair style and table design became a casting session for a needle in a haystack. Many options were in contention that needed to satisfy the requirements of style and practicality, in addition to being available in sufficient quantity and at a reasonable price point. 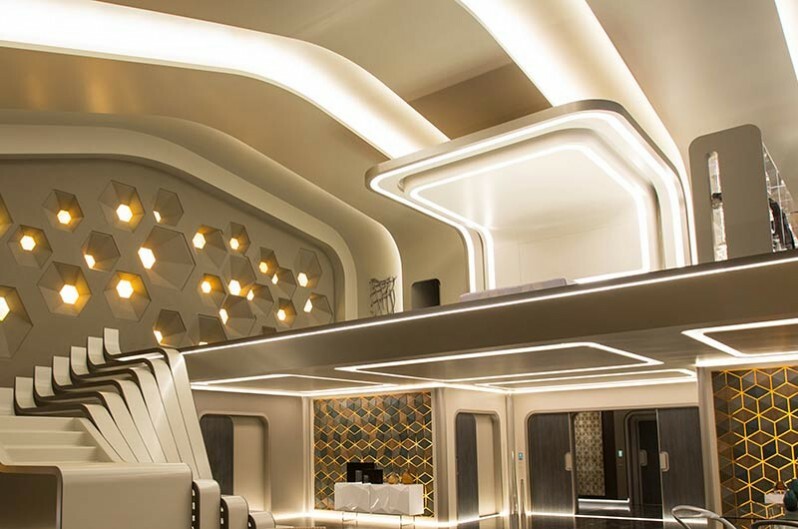 One of the things I love about this set is it embodies the themes of the movie: Two characters in virtual isolation are plopped down in these vast spaces that were designed to accommodate thousands of passengers in a state of utopian harmony. The cafeteria becomes a blank canvas onto which we project the internal conflicts of Aurora and Jim as their relationship unfolds. It also establishes and heightens their class differences. Vienna Suite...speaking of class differences! 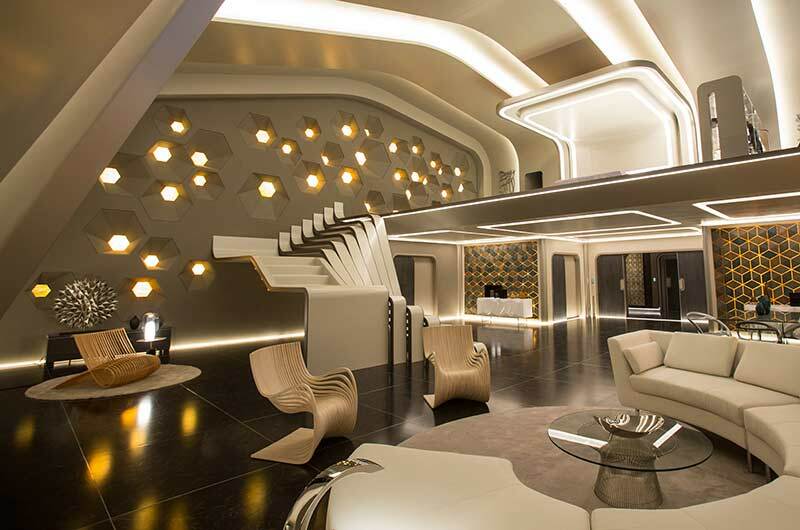 Serdena: The Vienna Suite is the luxury class apartment of which Jim takes possession—after all there is no one else awake to have use for it—and is meant to contrast sharply with his assigned living quarters, which are cramped and severely lacking in luxury appointments. The pleasure of decorating this space was akin to having Dad hand you the keys to the Porsche. It's a high performance machine, and you better handle it right. I think we pretty well managed to not crash. 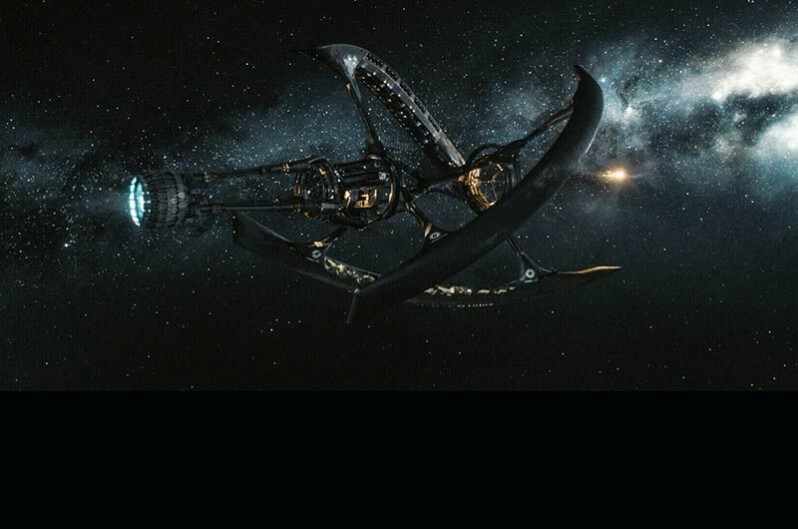 Serdena: We wanted to use mechanical tools and clutter to disrupt the austere beauty of the spaceship, both as a function of character, as it illustrates the desperation of Jim to break down the door to the command deck, and also to highlight the futility and despair of failing at his task when he discovers the passageway to be virtually impenetrable. SET DECOR: Was that a subtle metaphor for the creation of these sets?!! Serdena: Sometimes we do get tired and cranky, and the pressure seems too much, but some of the most sublime moments are when you're there with that team of amazing, creative people, and you're connected and having the profound experience of making something that didn't exist a few hours ago. And you kind of guide each other and the thing that you're making to this new place. 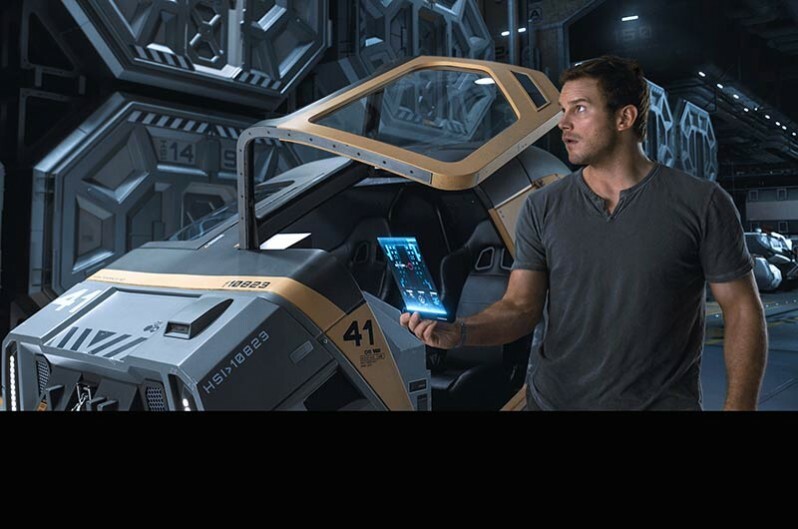 Want more “Inside the Starship Avalon”? Check back after the first of the year for more photos and more insights!